The most iconic newspaper headline. Max Clifford's finest moment? Definitely. Almost as soon as I tweeted the topic this morning it came in. Apologies to those from elsewhere but in the UK it was either this or something about a Scottish football team. Everyone of a certain age remembers the headline from March 1986 because, although we all thought comedian(?) 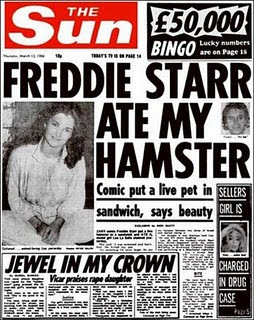 Freddie Starr was a bit of a mentalist, this confirmed it. Was it true? Back in those days The Sun really didn't care about such things. Three years later the headline 'The Truth' would mean the city of Liverpool would turn it's back on the paper for good because of the lies contained within the article that followed. These were the days before politically correct headlines and many of you suggested others from (pretty much exclusively The Sun) that were equally memorable from the same period. But for me at least it's the image of Freddie Starr tucking into a hamster sandwich that has stuck. Poor old Max it could only go down hill from here, his one moment of utter genius.